They say the best place to experience any destination is through one’s stomach. While that may be debatable, the fact remains that one of the Filipinos’ favorite pasalubongs aren’t just key chains, but also food. In the island province of Bohol, there’s a growing industry of local entrepreneurs introducing more specialties that will tickle the taste buds of anyone—may they be from Metro Manila or Argentina. 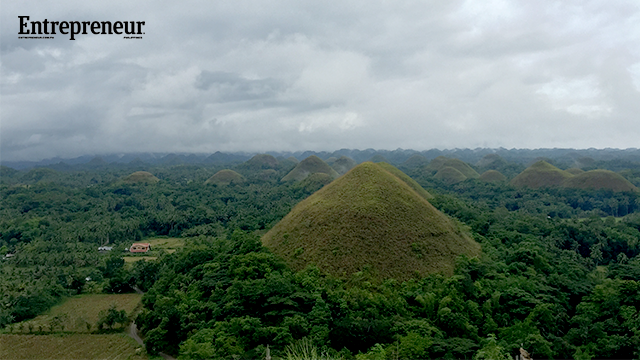 An ode to the world-famous Chocolate Hills, Peanut Kisses has long-been a staple on every tourist’s pasalubong list. It was in 2003 when Bucarez Food Processing Corp. stepped in to the local production of the said delicacy, bringing double-digit revenues to the product and catapulting it to a steady success, until today. 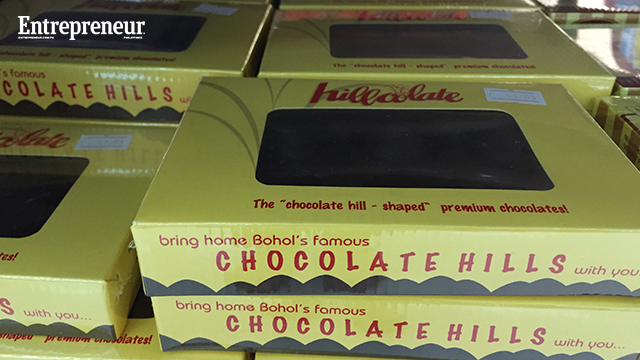 Similarly concocted out of the locals’ love for the Chocolate Hills is Boldi’s Hillcolate, premium chocolates shaped out of the famous tourist destination. The delicacy has three variants: plain dark, crispies and truffle filles. While Peanut Kisses have reached some supermarkets in Metro Manila, Hillcolate is still exclusively available in the island province. 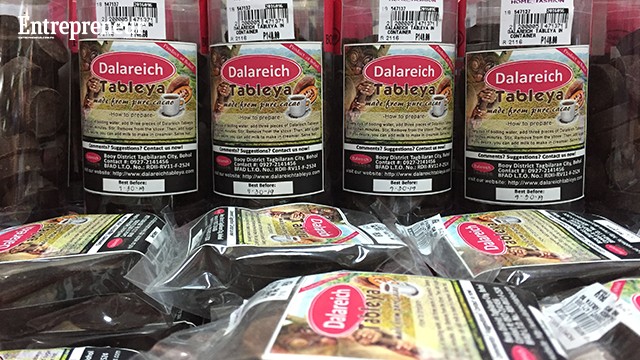 Unknown to many, Bohol also produces its own cacao and has a local tablea manufacturer to boot in the form of Dalareich Tableya. Founded by Mr. and Mrs. Ricardo Polot in 1994, the business had small operations for more than a decade until their daughter stepped in six years ago. From the five kilos of cacao it usually cooked with in their kitchen, the small factory now uses between 300 to 400 kilograms of cacao daily to keep up with demand. Named after their daughter, Dalareich, the Polots had to quit their day jobs as a tricycle driver and government worker, respectively, to fully dedicate their time to the business. Since its boom, it has also become an advocacy of the family to encourage local farmers to grow their own cacao in their respective backyards. Almost a hundred kilometers from Tagbilaran City is the fishing town of Anda. For years, fishermen from one of its barangays called Talisay have been producing tilapia chips, out of their extra catch. In fact, it led to the formation of Talisay Fishermen’s Association (TAFIAS) solely for the sale and growth of their initiative. However, as the years passed, the product still did not quite make a splash, even in the local tourism industry. By 2015, it found refuge in non-profit organization AndaKIDZ, which helped the community develop the product, from its taste down to branding. 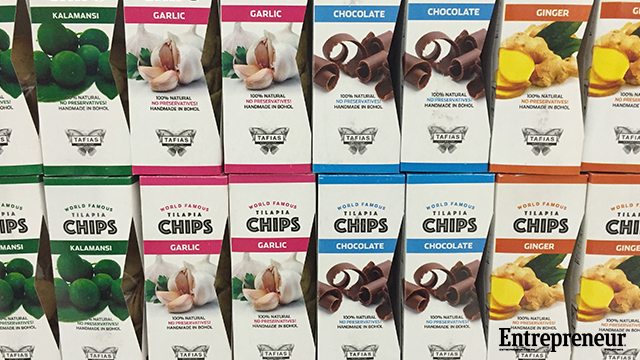 The result was a product made for supermarkets, with a distinct look, and was launched with various flavors, from chocolate to ginger. 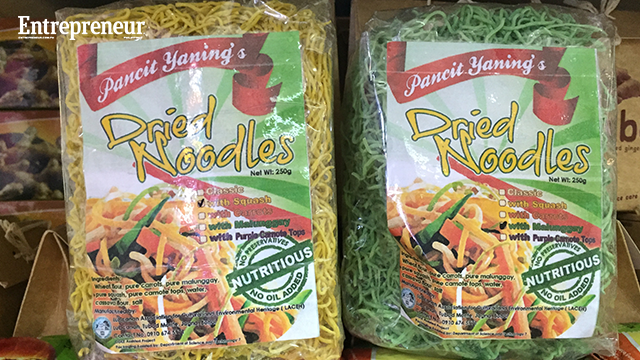 Supported by the Department of Agriculture through its rural development projects in every region, Pancit Yaning offers a range of dried noodles partly made out of various vegetables and greens. So far, it produces five variants: classic, squash, carrots, malunggay and camote tops. While it hasn’t reached leading supermarkets in Metro Manila, Pancit Yaning is slowly getting off the ground as it now supplies local malls in Bohol and select local markets.